Coming to online world, physical storage has begun to be considered an outdated thing. This assumption is also supported by several shortcomings of physical storage, such as a lack of adequate space, vulnerability to corruption, physical form that’s easily lost, etc. Therefore, many people switch to online storage or cloud storage. This is relatively more reliable and considered to have a fairly long development period, considering the internet network is now more accessible. Unfortunately, because of these opportunities, cloud storage brands began to arrive with their respective features and advantages. Furthermore, this article will discuss about the two largest cloud storages, which are Dropbox and Google Drive, along with the advantages and disadvantages of each. Speaking of online storage, it must depend on how easily storage is used. For efficiency, the drag-and-drop system has been applied to cloud storage brands, making it easier to store and move files. In addition, quick access or sneak peek that allows us to see a bit of the content has also been implemented properly. 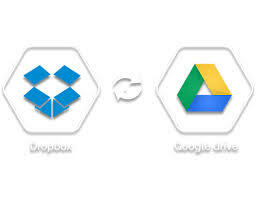 But, in terms of universality, Google Drive is superior to Dropbox. Google as a giant online company tries to make one access to all its services through Google Mail, including Google Drive. So, if you already have a Google Mail account, you don’t need to register again. Dropbox still can’t rely on such universality, so it will be a little inconvenient for those who don’t have a Dropbox account. For file management problems, Dropbox excels with simultaneous features of across device syncing. By using special application, Dropbox allows you to make changes which will also apply online. These features are still not available on Google Drive. They instead require you to download the entire file, make changes then re-upload. In terms of file sharing, Google Drive is more reliable because of secured sharing features which apply permissions to files to be shared. In addition, since Google Drive is online-based storage, it is not app-based storage. You can share files to anyone who is connected to the internet and can log in to his Google Drive account. Either Google Drive or Dropbox both have a free payment plan wherein the initial user will be given some free space, but the significant differences are in the capacity provided. In this case, Google Drive felt more generous by giving more than 10GB free to initial user, while for the initial users Dropbox had to settle for only 2GB. If you are not satisfied with free space shared by both cloud storage, you can upgrade and become a premium member with price of $10 for each Terabyte. That’s the basic difference from Google Drive and Dropbox. Indeed, each of cloud storage must have advantages and disadvantages. The most important is which one is the most convenient for you to use. If you are in doubt with compatibility, all large cloud storage already has a cross-sharing feature, so you don’t need to doubt the compatibility issue.